U F O o v e r S p a n i s h s e a r e s o rt ? This is a photo I recently took when on holiday in Calella, Spain. Back home, I was having a look at the pictures when I noticed an object in the upper right corner of one of them. To be honest, I think this is rather strange, and I would like to know the opinion of someone who's looking into this sort of thing on a daily basis. Personally, I already wondered if a pigeon might have passed in front of the camera at that moment, but I'm not sure, because it's not very sharp. A reply would be welcome. The EXIF data of the photo - EXIF stands for "Exchangeable Image File Format" - revealed that the picture was taken on May 20, 2006 at 1:16:55 p.m..
- Email from Yannick VAN REUSEL to BUFON dated May 30, 2006. - Email from Levi BOTERDAEL to CAELESTIA dated August 8, 2006. - Email from Yannick VAN REUSEL to Wim VAN UTRECHT dated October 20, 2007. Photographs with blurred, elongated shapes in horizontal or oblique position are regularly received by UFO groups. Typically, in most of these cases, nothing out of the ordinary was seen when the photos were taken. Being less "open-minded" than the average ufologist, we suspect that, when nothing unusual was observed, perhaps nothing unusual was present. In other words, we are convinced that such images show real, but common objects, be it an insect, a bird, a leaf, a piece of paper or any airborne object that happened to pass in front of the camera at the moment the shutter-release button was pressed. 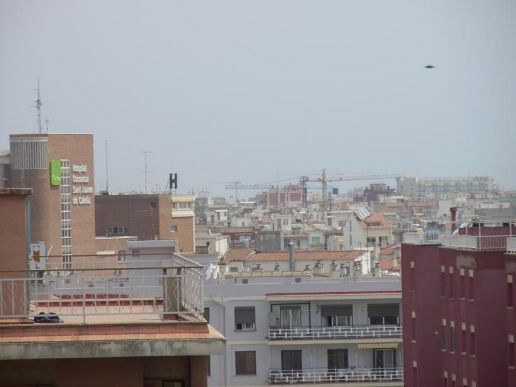 In the Calella photo the shape points to a bird, just as the photographer already suggested. A closeup of the unknown object. The shape is compatible with that of a bird with its left wing pointed towards the camera. Note the "turbulent air" around the object. This halo effect is caused by JPEG compression of digital images that contain dark objects against bright backgrounds. To illustrate that birds can look like small disc-like objects when captured by a camera, we photographed a few pigeons ourselves. One of our shots is published below. 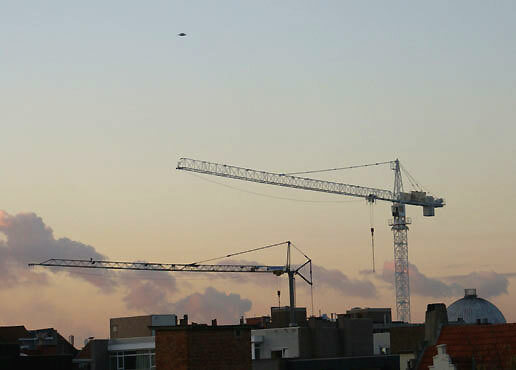 A pigeon over Antwerp city, Belgium. Probably the biggest mystery with images like these is that they keep popping up in UFO books and on UFO web sites despite the fact that there is a host of perfectly logical explanations for them. See our bird pictures gallery for additional images of birds frozen in flight that resemble UFO-type objects. There is no reason to believe that the object on this holiday picture was anything other than a bird.